A pot of chili simmers on the stove, smelling of onions, hot peppers, and garlic, though its main goal was to use up many of our tomatoes from the garden. Last night we had our first fire in our fireplace, I baked scones for breakfast, and brownies after dinner. I don’t know what it is, but autumn always finds me in a baking and cooking mood. It must be that clear, crisp air and the welcome warmth of the oven. With the cold weather has also returned my urge to knit. Projects abandoned with the onset of summer have been dug out again. New armwarmers must be started to replace the ones I’ve somehow lost (or lost at least one of). 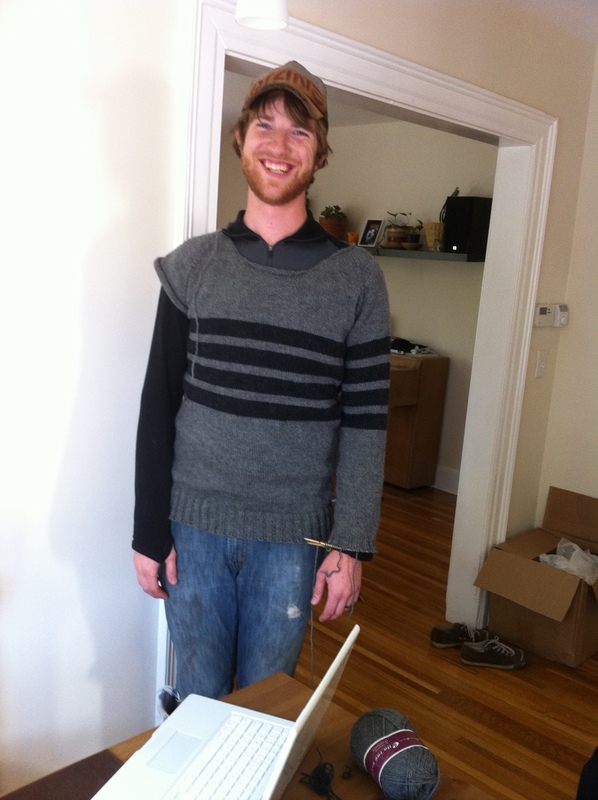 Chris’s wool sweater, started in early spring, will finally be finished. I’d stopped working on it when he was out of town once, because I needed him to try it on before I finished the sleeve. Then it got hot, and I just didn’t pick it back up. I also found a pair of socks I’d knit for him, and just never wove in the ends. Armwarmers are essential, I feel especially for knitters. When the house is chilly, I can always bundle up, with the exception of my hands. And my hands are always cold. My armwarmers help a bit. I can’t believe I’ve lost so many pairs now. I used to have at least five. I tried to start some the other day, in a rush to find a project to bring somewhere. I couldn’t find any yarn appropriate to my needs, but did find some evidence of moths in a yarn bin. Appalled, I closed the bin, vowing to take care of it later. Welcome, autumn. I’m ready to knit, to jump in leaves, to bake, to cook all the produce from the garden and farmer’s market, to enjoy the cool mornings and walk my husky without worry of overheating him.